In one day we made the 400 Km. 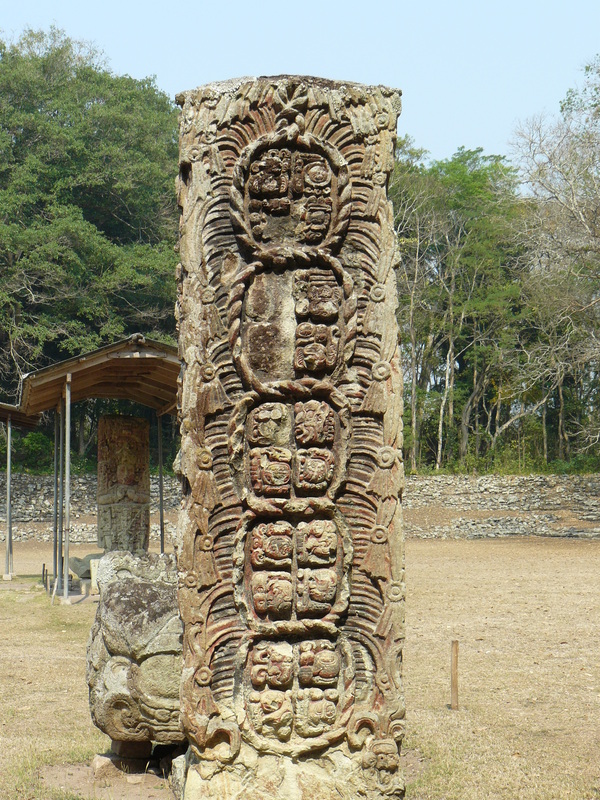 trip from Quetzeltenango, Guatemala to Antigua and then on to Copan, Honduras by way of a shuttle bus. The ride was boring – sometimes the roads were good. That means not bumpy or full of pot holes and not riding on steep winding roads. I guess the roads were bumpy enough, as my bag and one other continued to fall off the roof of the minivan. Finally one of the other travelers offered up a piece of rope so the driver had enough to adequately secure all of the bags. One of our general rules is to not get into a town after dark but on this trip we weren´t able to accomplish this as we thought/were told the second leg of the trip was 4 or 5 hours and it was 7+. The good news is that the trip through the border couldn´t have been easier. 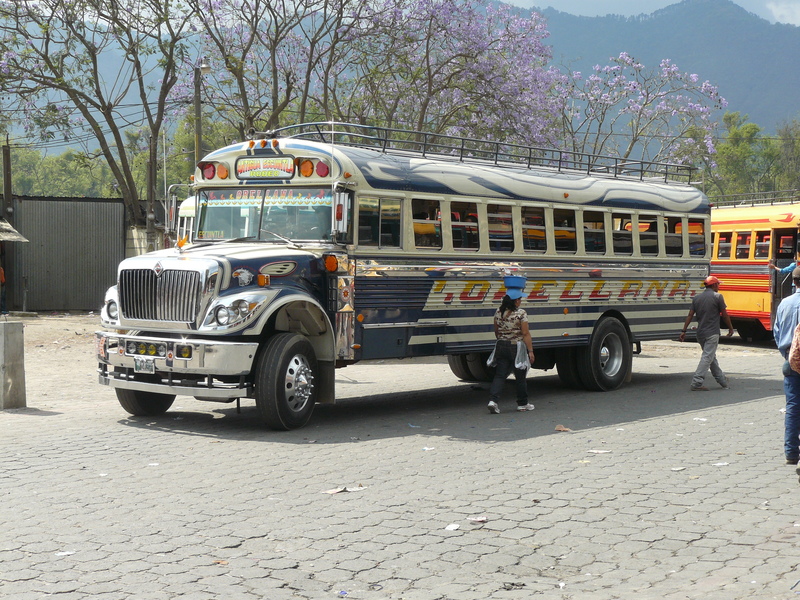 Upon arrival in Copan or Copan Ruinas, a town of about 6,000, the bus driver kindly dropped us off in front of a hotel (likely a friend or connection?) which just happened to have rooms and they had a restaurant of sorts. As soon as our minibus slowed down, about 5 members of the hotel family were offering us a room and boasting the wonderful accomodations, hot showers, hammocks, etc. Tired from a day of travel and not being familiar with the town, we were pleased for the offer, and at a price of $15.00. That is until Kevin was sound asleep and I couldn´t sleep because it sounded like street traffic was coming right through our room. Exhausted from not sleeping, by morning I couldn´t wait to hop into the shower. It was warm for about 5 seconds and then turned ice-cold. We found a new hotel. 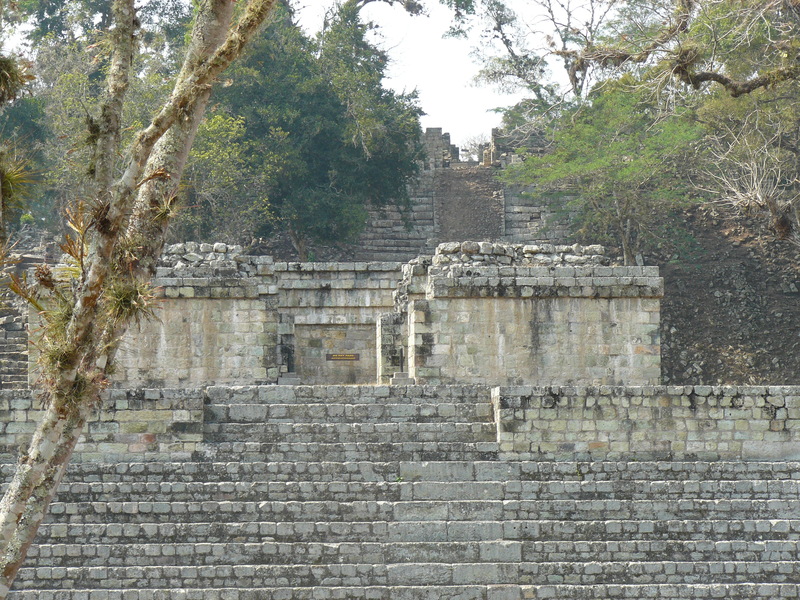 Not having heard much from fellow travelers about these Mayan Ruins, we weren´t expecting to be awed. 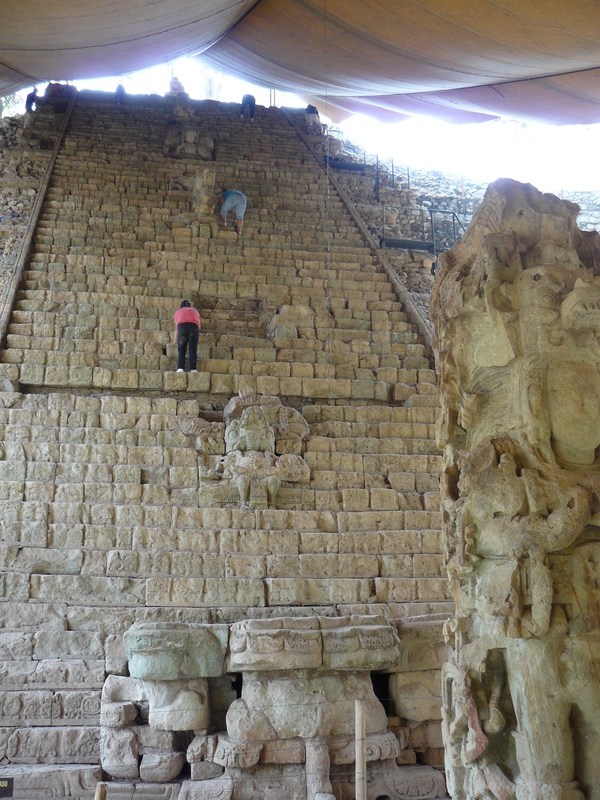 Most of this Mayan city has not been excavated but what is there is spectacular. The beautiful hieroglyphics and estrellas are amazing. 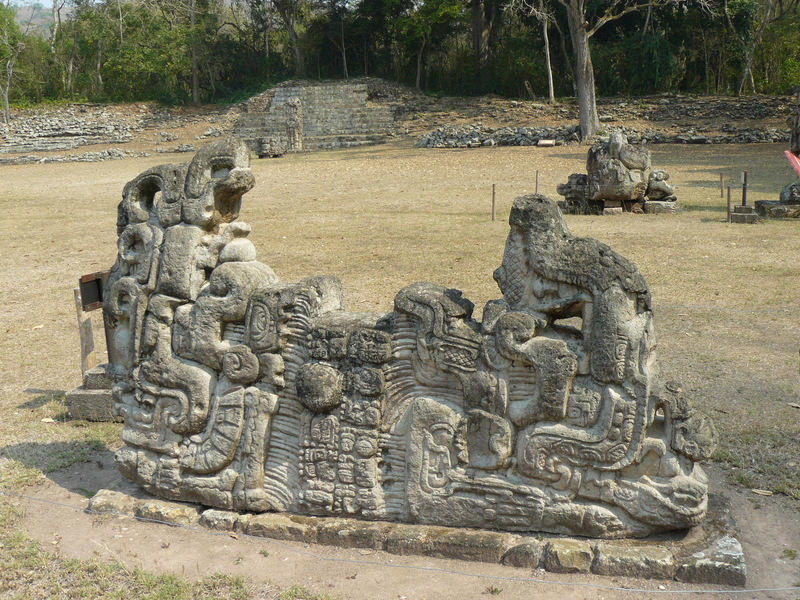 Here are a few photos to whet your appetite for this ancient site. The rest of our short visit to Honduras was quite an adventure and is worthy of a separate post. Stay tuned. On the last post I wrote about our visit to Cuidad Viejo and the Nuestro Futuro school. 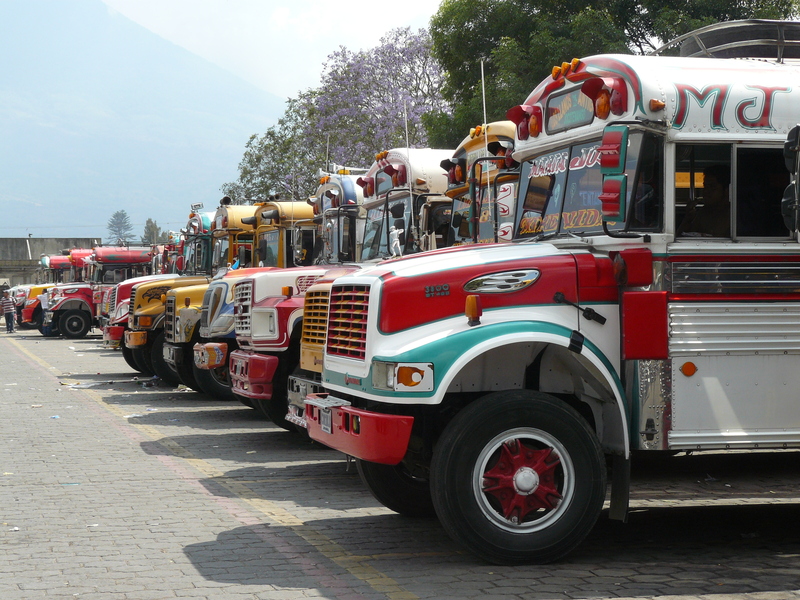 Another fascinating though less humanistic part of the visit to the “old city” was a visit to one of the city’s many “Chicken Bus” garages – I’m not sure what you call a place that converts tired school buses from the US into brightly colored Guatemalan Chicken Buses. This staple of the Central American economy is well know by anyone who has traveled here. The drivers regularly speed through the country-side and the city streets, stopping for seconds less than it takes to get the last rider on board. Music of the driver’s choice blares so you can’t hear anyone speak. The buses are packed with local people as well as the baskets, sacks of corn or packs of goods they have purchased; the roof is also packed, sometimes with crates of chickens or with baskets of food or household items purchased in town. On market days the buses and rooftops are particularly packed because a Chicken Bus maybe the only means of transporting items to be sold at the market. 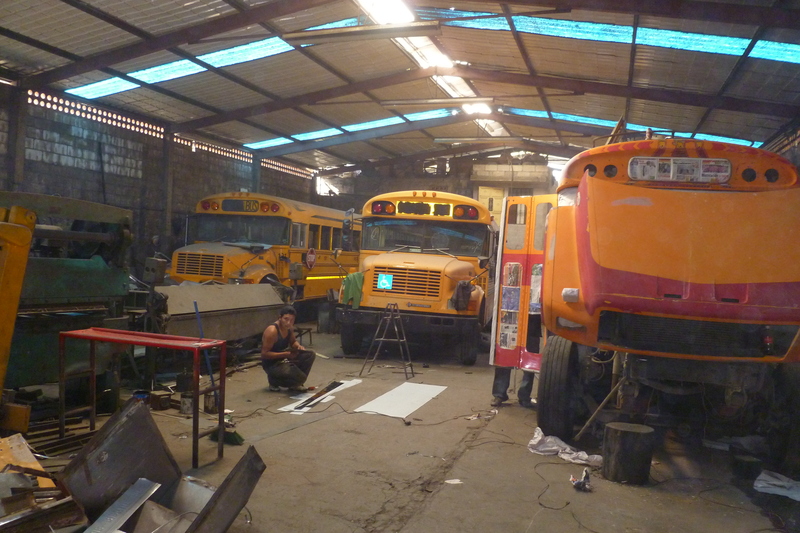 In Cuidad Viejo there are a large number of garages or old warehouses where old yellow school buses are refurbished into the colorful and highly functional buses. The one we visited had 4 buses in varying degrees of conversion. The 4 skilled workers remove the bench seats and replace them with seats that seat 3 instead of two people. That means the aisle is about 18″ wide – not nearly wide enough for us fat Americans. In addition, roof supports are added for the heavy roof load, strong internal shelves are added, and doors are switched to fold inward, probably so the bus doesn’t clip some innocent person as it speeds through the streets. A major change is to shorten the bus by cutting off the rear; the drive-shaft is then shortened so the buses can turn on the narrow streets. Oh, and a ladder is added so the driver’s helper can quickly climb on top to stack or remove items. After all of the functional changes have been made the bus is “pimped up” with a colorful paint job of the owner’s choice, chrome trim is added and the bus name is painted on the front and rear. 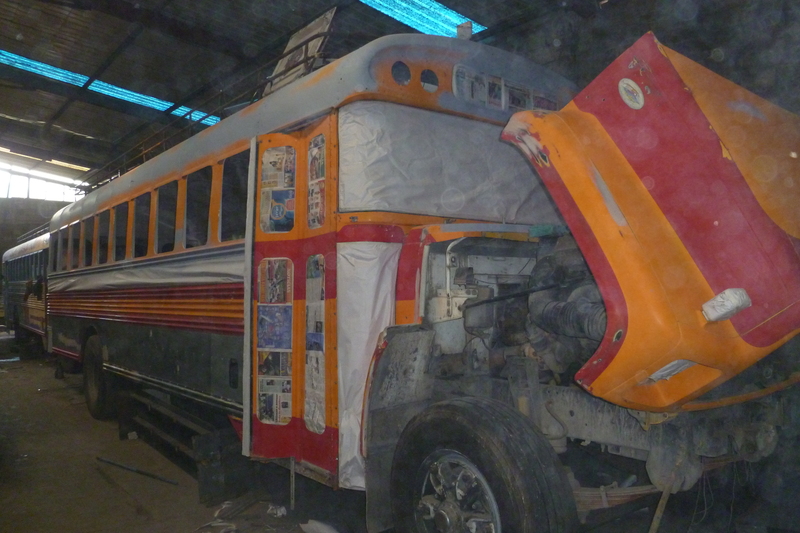 If engine work was needed, the engine is replaced and the bus is ready for the only means of transportation available to thousands of people, whether they live in the cities or the rural areas. 2018 RTW Fast: I’m in.